Hello:) We are a small studio, started by Agata, who made Karambola - a short point and click puzzle about emotional fruits and veggies. Yeah. Later on joined by @dos (creator of so many treasures such us Tickle Monster vs. Suits, Hurdlinator, Supershod, Boiled Corn, Love Case, WAAAA..the list goes on...as well as co-creator of The Secret of Tremendous Corporation and Minotour), which resulted in many fabulous gamejam creations and a not-so-secret next big project. Check out twitter or fb for updates. 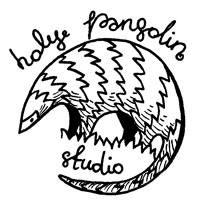 If you like our games, get in touch at: holypangolin@gmail.com and if you really like them and are able to, of course support us financially on our way to break from the system and escape to land of fresh grass and happy kittens (and create games from there).